We are still looking for interesting ways to eat our veggies...and use up some of the ubiquitous veggie of summer...zucchini! As I mentioned yesterday, bloggers are so positive and generous...I did say generous, too, didn't I...and today I have a true example. Tanita Davis is an author extraordinaire of two books (with another being written), both dealing with charming and determined young women, one a cook who wants her own cooking show and the other a World War II WAC who gets sent to the European theatre to get the mail going to the troops. 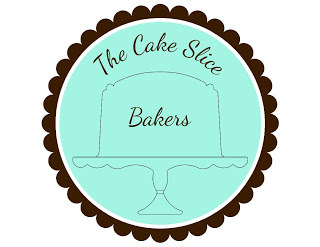 You can read about them at her blog Tanita S. Davis. Better yet, go order them on Amazon or at your local bookstore. 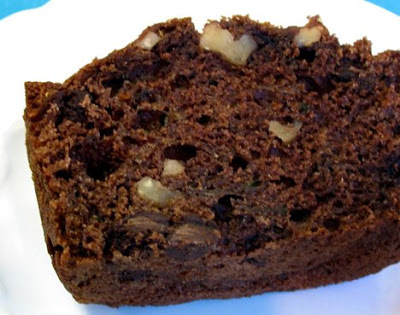 Tanita left a comment with a link to a yummy chocolate zucchini bread. The link was to a blog, Jama Rattigan's Alphabet Soup (where you should check out her enormous zucchinis), and Jama linked to another blog where the recipe was posted by a friend, Robin, of the blog Robin Brande. She told of the woman, Elizabeth, who made some of the bread and gave it to Robin. Got that? I think Elizabeth has a blog, too, but I couldn't find the link to it. So now, due to the generosity of each of these women, I have a recipe for Elizabeth's Phenomenal Chocolate Zucchini bread, which does indeed use up another two cups of shredded zucchini. Woot! Looking the recipe over I see that it, too, contains a whole cup of oil. It also has a lot of sugar, and cinnamon. I like sweet, but the chocolate has some in it, so I'm losing 1/2 cup of the sugar. I like cinnamon, but not with chocolate, so I'm losing the cinnamon. A half cup of yogurt will replace 1/2 cup of the oil. Best of all, I'm adding 1/2 cup of chopped dark, sweet cherries because chocolate and cherries is a flavor combo that makes me happy. I also reduced the nuts to 1/2 cup. This is a great bread to give as a gift, especially if you make smaller loaves (just bake them a shorter time), or you can freeze some for that far off time when garden fresh zucchini and sweet, dark cherries are just fond memories. Bread Baking Day is an ongoing event and this month, for BBD #22, Stefanie of Hefe und mehr asked us to make sweet breads. It doesn't get much sweeter than chocolate and cherries, so I'm sending this over to her. With all the changes it probably should be called Elle's Phenomenal Chocolate Zucchini Bread, but I'm calling it Chocolate Zucchini Bread with Cherries...simple and true. It is probably a lighter textured bread than the original recipe, but still has a nice chocolate kick, especially when eaten warm. Speaking of generosity, next time a neighbor wants to gift you with some zucchini (unless you have your own plants overtaking your garden), say 'thank you!' and make this bread. You'll be glad that Tanita, Jama, Robin and Elizabeth were all so generous, too. Preheat oven to 350 degrees. Lightly grease two 9x5" loaf pans with canola spray. In a large bowl, combine flour, cocoa, soda, baking powder, and salt. Mix well. 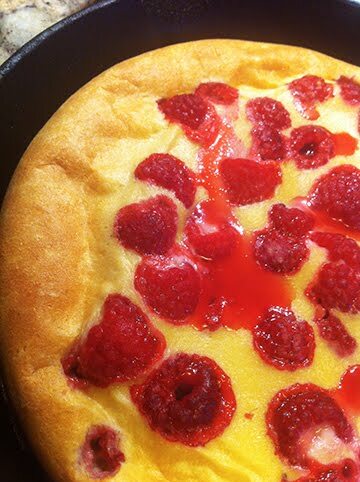 In a separate bowl, beat eggs (or egg substitute and water) with the sugar until well combined. Add oil, yogurt and vanilla. Beat to combine, then stir in zucchini. Add wet bowl to dry bowl and stir until just moistened. Stir in nuts and chocolate chips and cherries. Spoon evenly into pans. Bake 55-60 minutes or until toothpick comes out clean. Cool 10 minutes in pans, then turn onto racks. This bread is yummy when eaten still warm...the chips are melty and the fragrance is full chocolate! This bread got Sweeties's seal of approval...he had some more for breakfast, and is asking for another piece tonight for dessert. I love to use zucchini this way! What a great bake! Yeah adding chocolate is my favorite way to use up excess zucchini!! I love the addition of cherries. Sounds really fabulous! MAN that looks good. And the cherries... *kisses fingers* what and AWESOME idea. I am really seriously craving this now. Yum. Looks moist and rich and perfect. Glad Sweetie likes it! 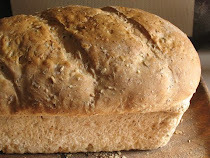 I love how my pal Elizabeth's bread is making the rounds worldwide! All I can say about your addition of cherries is niiiiiiice! Have you tried slicing them into 1/2" circles, sprinkling them with rosemary, thyme, oregano, lemon ... and then dehydrating them? That's what we did with them, and it's really a fabulous way to eat them! If you don't spice them, you can cut them up with scissors (dehydrated) and make them into fruit breads all winter long! Just rehydrate them in something sweet and it works out wonderfully! Your cherries and chocolate look heavenly. Just over from Pea's and see your in Seattle, we arrive Seattle on Thursday. Are you sure you can't break from the move? 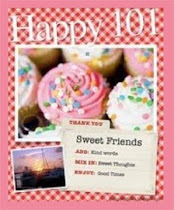 Anh, Thanks! Now if I only had you to photograph this bread...your photos are always so beautiful! 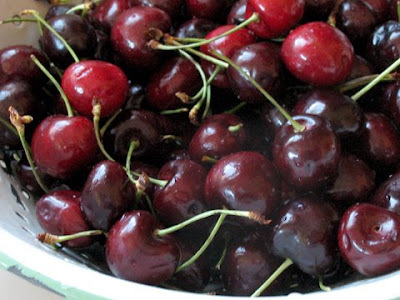 Tanita, must thank you for the links...are cherries in season there? Would love you to taste this bread! Robin, Thanks for making it possible! DaviMack, that does sound like a great way to keep the zucchini ready for using in the kitchen. I like the herbed idea...mmmm. Tanna, Let's see if we can make the time for coffee at least...imagine being in the same city at the same time! Kismet. What a great way to use up zucchini. 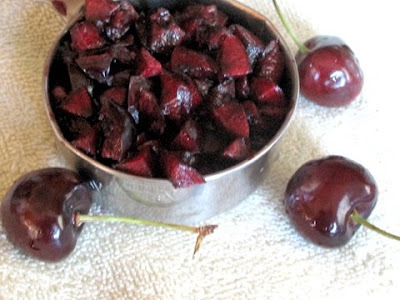 Adding in cherries is a stroke of genius! This is amazing bread! My daughter made it and I could barely keep myself to having just one slice. Ok, I had two. Definitely going in my keeper file. It was so fun to meet up with you! Thanks for taking the time. 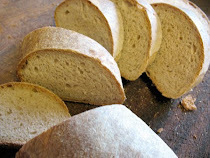 Lynn, Glad you got to have some...and it is difficult to stop eating this bread. It was so much fun to meet you and spend time in your town. I love your wicked sense of humor! What a delicious way to use zucchini. 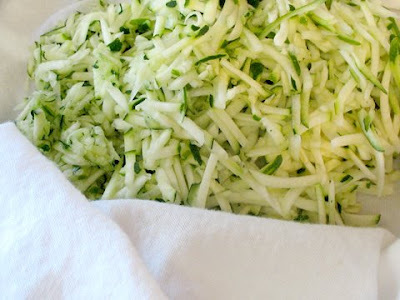 I get many zucchini from my boyfrinds parents, so I will try this recipe for sure. great recipe! i substituted fresh pluot for the cherries (out of season here) and spelt flour for wheat--the end result is fantastic! ahh... i love it when things come out right. thanks!